On November 6 the ruling Nur Otan party held an anti-corruption forum in Astana. As corruption poses serious challenges to this post-Soviet state, its officials are likely to be concerned with it rather on personal level than formal one. Making what it appeared like a policy speech addressed to all government workers in Kazakhstan, President Nursultan Nazarbaev displayed not only his anti-corruption zeal but also taught Kazakh officials how to behave properly in public. Officials, he said, must become role models of justice and modesty. Eight ethical norms proposed by the president for the officials include “honesty” and “law-abidingness,” which encourages interference in any actions harmful for national interests committed by some other government workers. The future moral code might as well include the president’s warning that whoever shouts and swears dirtily at subordinates must be dismissed. This idea was repeated by the president several times, as he said that officials should not “confuse” their own money with that of the government and must be able to provide financial background for their livelihoods, which often look disproportionately fancy considering their budget-based salaries. The president reminded of a strictly defined list of corruption-related crimes and tightened charges. Officials fired with charges of corruption will be stripped of privileges and banned from working in the state agencies again. According to a survey referred by the president, many people of Kazakhstan find themselves in situations where giving bribes prove more effective in solving their matters than going through legal procedures. It revealed that corruption highly penetrated such state institutions as the law enforcement agency, local administration, and such spheres as judiciary, health, and education. More than 1,500 corruption cases have been registered throughout the country since January. 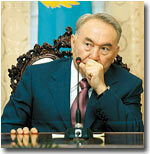 “It threatens our country’s economic growth and political stability,” Nazarbaev said. He proposed to concentrate power of fighting corruption in one body as opposed to today’s situation where this power is dispersed among the National Security Committee, tax and anti-corruption agencies. Specifically, the national anti-corruption plan suggested by the president envisages financial monitoring, mechanisms obliging officials to critically react to corruption cases revealed in mass media, and reports of corruption level of each government agency, according to which they will be later judged. The president said that the Kazakhstan’s government system is standing on the doorsteps of bringing in a new generation of professional government workers, who would strictly follow the ethical norms. It appears easier to hire new people than to re-educate the incumbents like akims, or local government heads that worked in the same position for years. Creation of lobby groups might as well break down the corruption schemes promoting corporate interests at the expense of the government, said the president. The government’s attempts to secure the financial stability should be seen against a backdrop of the world financial crisis, said Nazarbaev. Predicting rise in house prices, the president called for people to abandon their practice of saving money expecting lower prices and begin buying houses on the current price.